I’m a children’s picture book author and radio announcer. I used to be a video producer (a while ago). I’m also a Mum of 3! 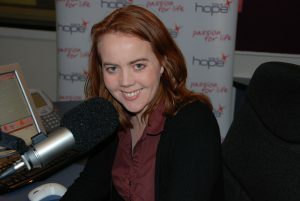 Sydneysiders may have heard me as the host of Hope Mornings on Hope 103.2. I’m passionate about child welfare, good health, books, the arts, leaf tea and I love a really good cheese. (I blame my Dad for my cheese addiction). I enjoy listening to folky/bluesy/roots music and I have to get outdoors regularly for my sanity! In 2005 I travelled to West Papua and it changed my life. Hopefully one day I’ll find a way to write about it. I grew up in the Riverina at Darlington Point, near Griffith, but these days I live in Sydney, with my hubby and gorgeous girls. Fortunately, I’m still surrounded by rivers and bush. I’m also surrounded by a gazillion Thai restaurants, but we can’t eat at any of them because of my daughter’s peanut allergy. That’s okay because I prefer Italian. One day I would like to live in Edinburgh, where I would drink tea, eat cheese, write a novel and walk everywhere. Come to think of it, that’s pretty much what I do now. Still want to know more about Katrina? Click here.